The atrium of the Gonda Building is a gathering place, waypoint and launching pad for patients and visitors on Mayo Clinic's Rochester campus. It can alternately be bustling with activity and a place of quiet reflection. It plays host to city and country folk, those from local communities and those from halfway around the world. They come seeking hope and healing, answers and understanding, care and comfort. A group of visitors earlier this week was after something a little different – ideas and inspiration. About two dozen Mandela Washington Fellows came to Rochester to tour Mayo Clinic and learn about the organization's history, the way Mayo practices medicine, and much more. 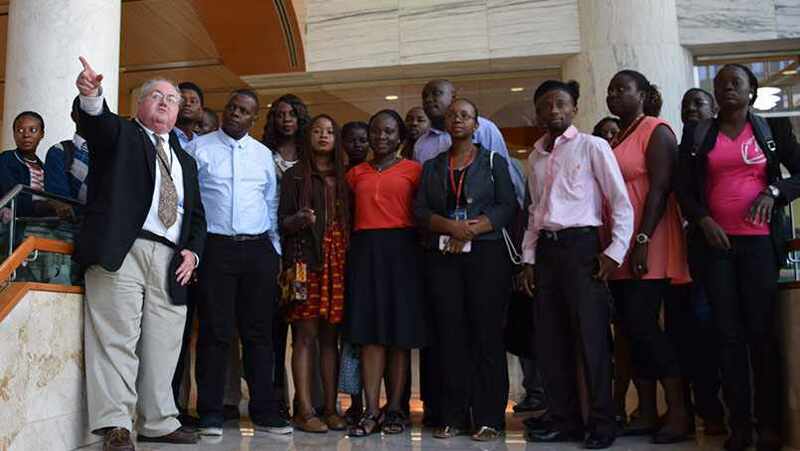 The Mandela Washington Fellowship for Young African Leaders brings "outstanding young leaders from Sub-Saharan Africa" to the U.S. to "hone their skills at a U.S. higher education institution" and take what they learn back home "with support for professional develop­ment after they return." Participants range in age from 25 to 35 and represent 49 different countries. John Murphy, Public Affairs, who served as the group's tour guide, says that since the group that visited Mayo had an interest in the health sciences and had heard about Mayo, it was "pretty exciting for them to come to Mayo Clinic." They started their tour with a photo opp at the Man and Freedom sculpture. Then they toured Mayo's downtown campus, including clinical areas, the Mayo Pharmacy, the laboratories and Desk C in the Hilton Building, the Patient and Visitor Cafeteria, the Historical Suite and library in the Plummer Building, Mayo's Center for Innovation, and more. The fellows were particularly interested in how Mayo Clinic practices medicine – the integrated practice model, Murphy says. They also were interested in Mayo's Center for Innovation and how new ideas become reality at Mayo Clinic. And, as "young people at the beginning of their careers," they also had a keen interest in how Mayo develops leaders within the organization. One highlight, Murphy says, was a stop at Center for the Spirit, where the fellows learned about the faith traditions among patients and visitors, and many wrote prayer intentions and placed them on the center's prayer wall. They also loved the piano in the Gonda building, Murphy says, and a man playing the piano even dedicated a song to them. In other words, just a typical day at Mayo Clinic. "It was a great opportunity to interact with this group of young African leaders that follows our tradition of sharing education and knowledge," Murphy says. "The Mayo brothers traveled throughout the world telling Mayo's story. And whenever the world can come to Mayo and hear our story and learn from us, we end up learning from them as well. It's just a great exchange." We'd like to learn from you, and you can share your thoughts below. You can share this story with others with the social media tools atop this page.